It's Shay here and I am so happy w&w can participate in this 2 day hop in honor of A Blog Named Hero's 5th Anniversary. 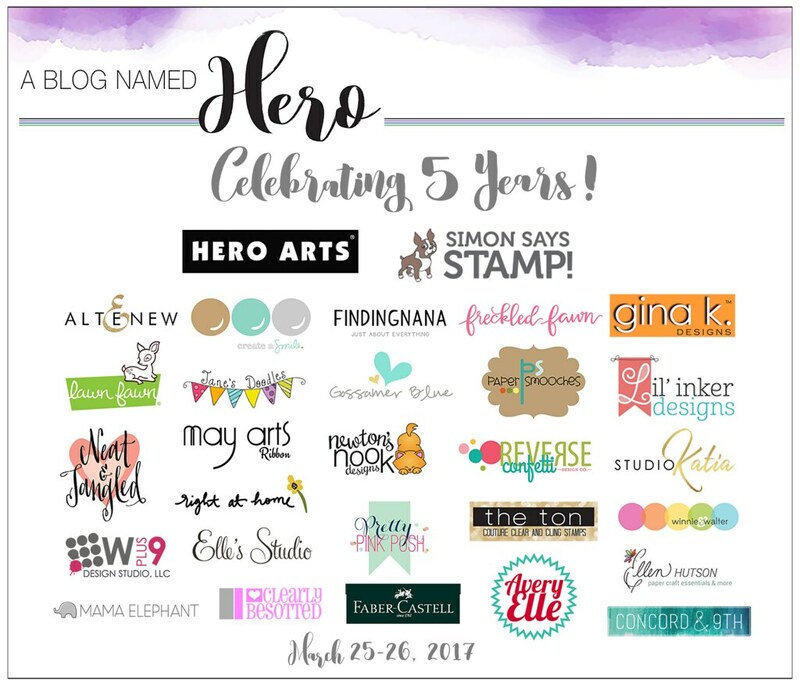 We were a sponsor a while back and loved working with the talented ladies of A Blog Named Hero! You should have come from the incredible Kathy Racoosin's blog. If you are lost please go to A Blog Named Hero. Each of the 2 days will have different prizes so be sure to visit A Blog Named Hero for more details on Saturday's post. Now that you know where you are and hopefully are in the correct place, let me share a couple of simple cards I made for you. Big surprise I decided to concentrate on stamping a background for my cards and I used In Bloom: Lola's Bouquet with Joni Andaya on white cardstock. I stamped the larger and middle sized solid roses in Tim Holtz Distress Inks (larger in spun sugar and the smaller in shaded lilac) and then stamped the coordinating modern rose detail for the larger rose in picked raspberry adding some other colors at times salty ocean, mermaid lagoon and seedless preserves and for the medium rose in seedless preserves, salty ocean and mermaid lagoon. The leaves were stamped in mowed lawn and the dots in crushed olive. I then adhered the panels to white card bases and added the sentiments ("cheers" from My Monthly Hero December 2016 which just happens to still be in stock and "thank you for your kindness" from Acts of Kindness CL911--a must have) I stamped with Versafine in black on a strip of white cardstock and adhered with dimensional foam adhesive. Lastly I added some sparkly sequins. I hope you have enjoyed my cards and you are inspired to ink up your Hero Arts stamps! :-) A big congrats to Jess + Lisa and everyone at A Blog Named Hero. Wishing you many, many more happy years of creating and inspiring. Your next stop will be the awesome Studio Katia! Very beautiful cards. i like it a lot. Shay, these are absolutely LOVELY. Love the texture in the stamping! Love all the pretty, happy colors of Spring! Great card! Very cheerful! Thx for sharing. What a pretty card. I Love the different colors you used and that large sentiment strip. Great design!! Beautiful cards, love the colors you used. Your card is just beautiful. I love the colors you chose for the flowers. Bright and beautiful color choices! Some of my favorite colors! Love how yu made your background. These colors are definitely cheerful. Your card will brighten someone's day! Happy 5th Anniversary! Thanks for the blog hop. What a lovely cards! Love the colors you used on your cards! Very pretty! Great cards! Great colors! Great company! such a lovely background you've created for your cards! I love your cards. I never really think of using Distress Inks for stamping. I tend to just use them for ink blending or watercoloring. Love your card. Thanks for sharing and a chance to win the give away. Love your stamped backgrounds, Shay--gorgeous colors! Love the colour combination and the card design on this card! You are a great company! The ombré look on those flowers really creates a beautiful look! So fun! Cheers! 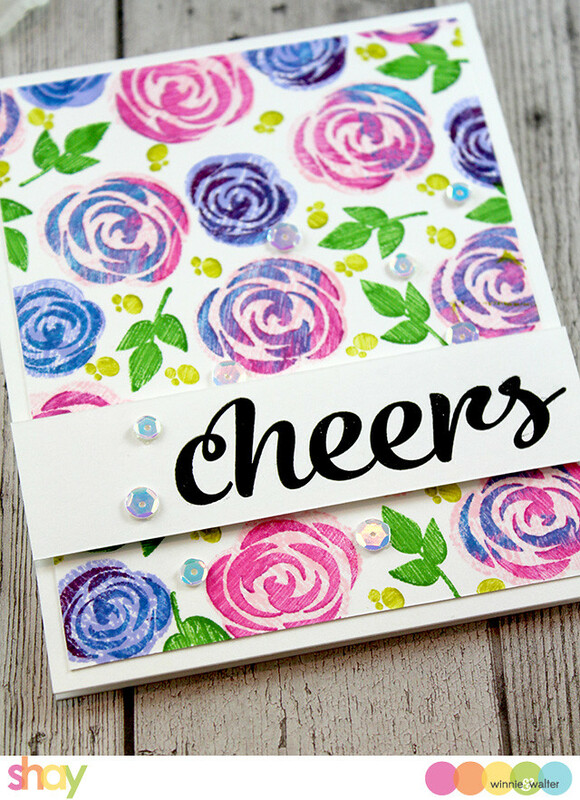 Such a great sentiment for such a cheerful card! Thank you for sharing! Lovely background on your cards! I love how you presented one background with two types of sentiment. Nice color scheme too. I recently started doing background stamping and I really like it! Gorgeous backgrounds! I love all the variations of colors on the fowers! Love your cards. The coloring is beautiful. I hope I can make a card with these gorgeous colors. I love these colors. Love your cards. Really love the font on "cheers"
Lovely cards, Shay. The multi-coloured flowers are so fun. And no, it's not a big surprise you focused on stamping a background lol. The stamping looks different - like it is swipped across the stamp - really pretty, colorful, and novel. Beautiful cards- love the bright colors! OMGosh so pretty, love them. Love your happy flower cards!! Thank you. Shay, your card is lovely. Great use of the colors. Thanks for sharing this. Love the backgrounds on these cards. Thanks for sharing! Thanks for the blog hop! 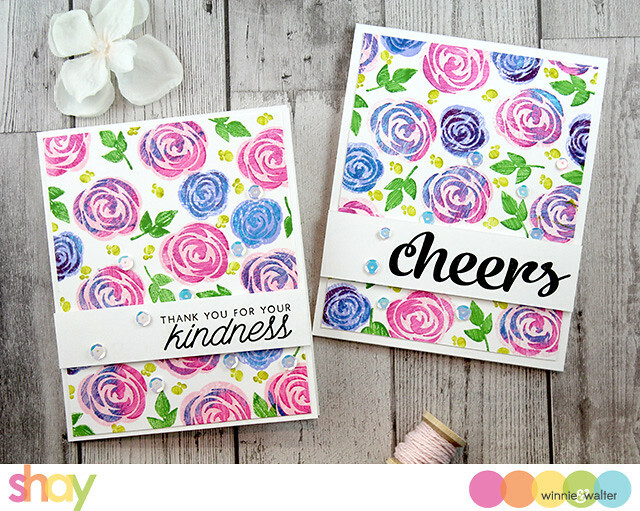 Great blog hop,and your card is so bright and spring like. Love it. Love it, such a beautiful and cheerful card! I love backgrounds like this! Great color combo! Thank you for posting! This is such a bright and happy card! Love it! what a fun and bright card, so happy! These cards are so pretty. I love your color choices. These cards definitely put a smile on my face! Such a pretty color combinations! Nice colour combos on these cards. Your card is beautiful, I love the background. Love the colors on this card! Lovely card. I love the color combination makes it stand out. Love your stamps, great card! Beautiful card Shay, love the way you mixed the colors with your wonderful stamps. Trying this today! Awesome cards! What a bright and beautiful card! So Springy! Happy 5th Anniversary! Great cards! Thank you for sharing! Two beautiful cards in great colours ! Thank you for sponsoring this great blog hop ! Love the backgrounds you created! Vibrant and pretty. Thank you. Happiness always on your 5 year anniversary to a blog called hero ! I just got this stamp set and love the card you made with it. Love to create! Beautiful cards! Perfect for the beginning of spring. Thanks for being part of the hop. Beautiful, colorful cards and a perfect design for many of our stamp sets! Lovely cards! Your color choices are just spot on! Beautiful happy cards. Winter is over! Beautiful. Love the colors. Thanks for the inspiration and participation in this blog. Like the multi-stamping of the flowers. Gorgeous background & happy colors! Fabulous colors and such sweet cards. Nice mix of colors in the background stamping. A stunning visual. Ohhh love the colors you used! Such a happy card with so many lovely colors and flowers! Lovely cards! They are so colorful and happy! Thanks for the inspiration and for the opportunity to win! What a gorgeous way to decorate a background! Such pretty, bright and inviting cards. Thanks! How lovely. So wish I could coordinate things like that! I love how you made the roses your background. Thanks for the inspiration and a chance to win. Beautiful mix of colors. Love color! Such pretty cheerful cards! Love these! Beautiful card. I love your background - the colors are gorgeous. So bright, beautiful and cheerful! Fabulous! Lovely set of cards. Love the bold bright colours. I love your background, pretty card. HUH! That background works WELL with different sentiments!! Beautiful cards. Love the dual stamp color so pretty and fun. What a fantastic background for so many different sentiments! Beautiful! Beautiful card and colors. It makes me smile. Thanks for sharing. I like the simplicity of the sentiment with just a hint of bling against the colorful background. I love stamping my own backgrounds! You made great color choices!! Beautiful!!! Thanks for sharing!! Such a cheerful card! Thank you so much for sharing. These are beautiful! I love the design and the colors! Love the rainbow of colors on the roses. Gorgeous! Absolutely stunning colours in your background. Love these cards. Love the color combination in the flowers on this card! beautiful card!! i love the flowers and the colors. Oh Shay, these are beautiful! What pretty cards! Love your color choices Shay. Surely a sign of Spring. Glad w&w are into this celebration for Hero. Such lovely colors and flowers! Bright and colorful!Beautiful!Thank you for the hop! Pretty colors - great design. This is absolutely beautiful. I love a stamped background, and these colors are lovely. Such fun inspiration.. thank you. I like these colorful floral cards. so cheerful! love the colors! Such a creative use of color! Lots of pretty colors. I like the bold lettering. Lovely flowers with cool colors. Love the backgrounds and I always love floral cards! Thanks for sharing and your contribution to the celebration! The colors you used are so pretty together. I don't think to use my Distress Inks for stamping and maybe I should give it a shot. This is so pretty. Two great cards full of lovely colors and texture. Talk about happy cards...these to fit the bill. If I got one of them, I'd be over the moon. Love the colors you chose...just like Spring. I loved the colors on your delightful cards. Beautiful cards. How fun to stamp. Just the card I need to send for spring! Made me smile to see your card! Love the colors you chose! Thank you for the chance to win! I have noticed a lot of cards using backgrounds like this and I love it! Gonna have to try this! OH so pretty cards!! I especially love that bold Cheers sentiment!! Wonderful use of the different colors! Beautiful cards! Thanks for such a great blog hop! Love how you colored your flowers on your card. Fabulously fun and vibrant cards! Love it! Nice cards. Love the colors. Wow, what a gorgeous stamp set! You can't go wrong with flowers that pretty!!! So much wonderful inspiration on this blog hop! I love your colors and the simple clean layout! Love the way you created the flowers.